Homicide investigators were called to a Manchester, New Hampshire, home where a body was found early Tuesday morning. 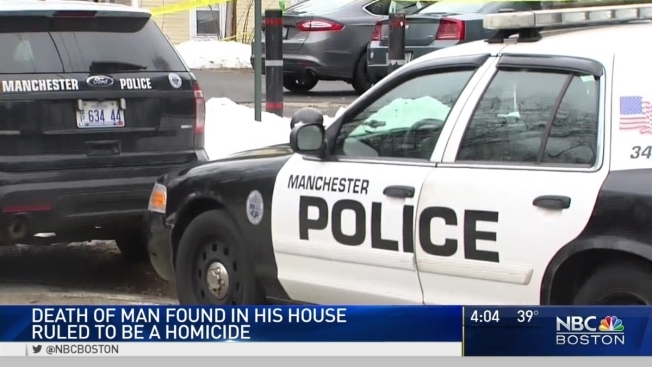 A homicide investigation is underway in Manchester, New Hampshire, after a dead body was found in a home early Tuesday morning. Police responded around 3 a.m. to a home on Douglas Street, where authorities say a man was killed overnight. "I heard banging," next door neighbor Shellie Roux said. "It was uncomfortable." She says it was an alarming wake-up call around 2:30 a.m.
"I looked out my bedroom window and saw a short person, chunky, with a black hoodie, and black pants on, walking out of the house and down the driveway," Roux explained. Patricia Hayward watched the investigation unfold from her kitchen window Tuesday. "When I looked out, there was a car with the lights on bright," Hayward said. In fact, she's been keeping a close eye on this same house for years. "Several times, the police were there because of domestics," she said. The attorney general's office is investigating this as a homicide. "I was like, 'wow, that doesn't happen around here,'" said William Morrill, who leaves nearby. His friend, Travis Janvris, agreed. "It seems there is a lot more crime in this area than we originally thought," Janvris said. For the last 55 years, Hayward has sat in the same kitchen chair, but only recently, she said, her view has started to change. "Very disappointed, this is a nice quiet neighborhood, and beautiful in the summer," she said, looking out at the police cruisers. "It's sad." The victim's identity is being withheld until next of kin can be notified. The cause of his death has not been revealed. No arrests have been announced, but authorities say the public is not in any danger.